In yesterday’s article, we went over the history between Boeing and China, how a friendship has created a success story lasting over 2,000 jets. But, that love story might be coming to a close with the rise of China’s own airliner, the Comac C919. After all, if they can make it themselves, then they don’t have to buy any more jets from the west. The Comcac C919 presented to government officials. What is the Comac C919? The Comac is the Chinese answer to the Boeing 737, the most popular commercial aircraft of all time. It is being designed to propel, or jumpstart, the local aviation industry in China. The Comac can seat 168 passengers in an all-economy layout (just short of the 737-800 capacity) and has a very similar range as well. Not only is it designed to take on the Boeing 737 but a huge range of other competitors as well. It is being constructed not just by a Chinese firm, but also a variety of international companies as well. It is through these partnerships that China has skipped rebuilding the wheel, and take advantage of the know-how of world-leading experts. Currently, the government-run manufacturer has 305 orders, all from Chinese airlines with the exception of the American company GE (General Electric) who are invested in the project. 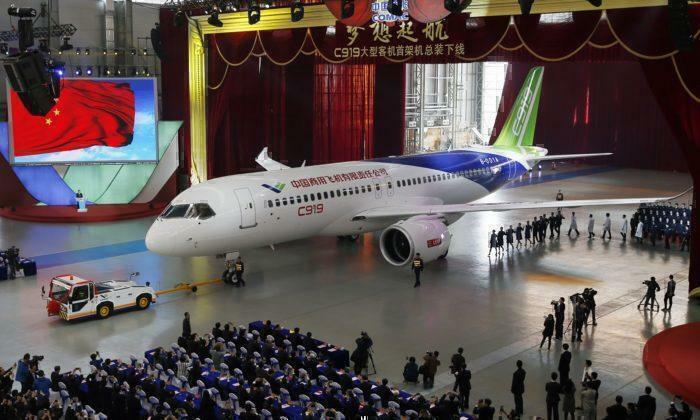 The Comac C919 will soon hit the world stage with China Eastern airlines in 2021… or not. What is happening with the Comac C919? The plane took its first test flight earlier this year in may, and have only done a dozen flights since. Additionally, the factory building the aircraft has only built one or two more aircraft. In fact, it is proposed that the local expertise is taking a much longer time to navigate the various steps required by foreign aviation bodies (Such as the FAA) to be approved for sale overseas. This can be related to language barriers as well as its test site, the very busy Shanghai Pudong International Airport. Plus, the aircraft needs around 4,200 hours of test flying before it can be used for the public. So far the two prototypes have only flown a combined 150 hours. To reach the deadline of service by 2021 they will need to fly around 150 hours a month. Comac has decided since then to transfer all of their testing operations out to western China, Yanliang in Xi’an. “As always, they’re learning, which means it’s going to take longer, It’s not like you are working with Airbus or Boeing who can go through this process within an 18-month time span. You need to account for the learning curve” – an Anonymous source close to the project. Only time will tell if the aircraft becomes the Boeing 737 killer they claim. What do you think? Is the Comac going to replace the Boeing 737?